WOBURN, MA (October 27, 2016) – Tocci Building Companies (Tocci)a Boston-area construction management company and Straight Ahead Ministries, a non-profit that provides one-on-one support to help juvenile offenders re-enter the community as productive citizens recently commemorated Tocci’s $15,000 donation. 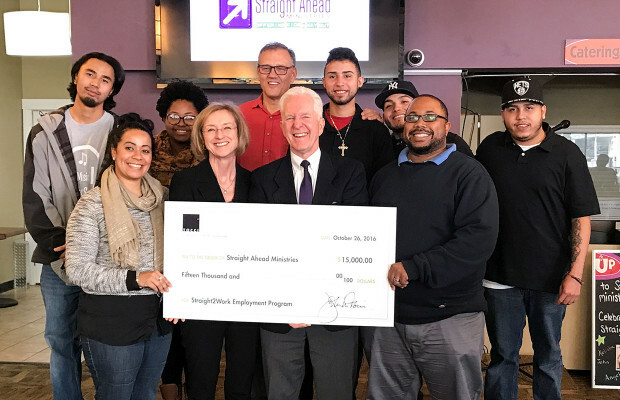 John Tocci, Chief Enabling Officer at Tocci, and Lila Tocci, Director of Company Life and Charitable Giving, presented the gift on October 26th during a celebration at Straight Ahead’s Worcester location in the company of Scott Larson, President of Straight Ahead Ministries, and recent graduates of the organization’s Straight2Work program. 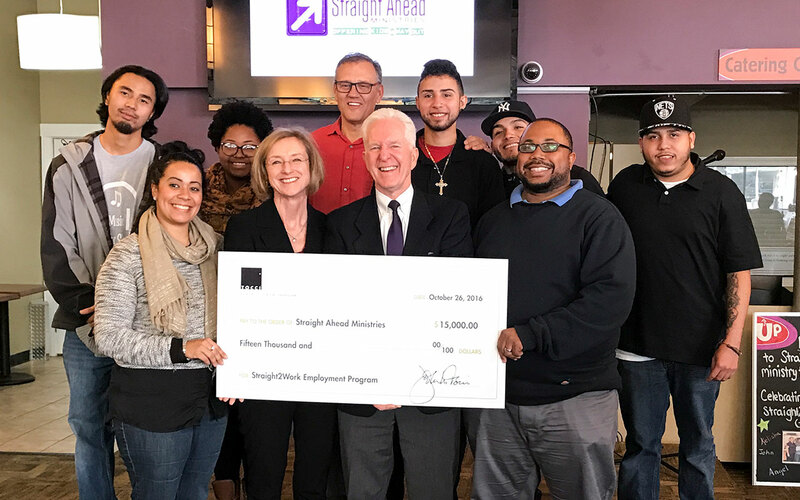 Tocci’s donation will support Straight Ahead’s mission to help formerly incarcerated young people learn skills and gain hands-on workplace experience through the Straight2Work program, which partners with Worcester-area employers that hire graduates of Straight Ahead’s training businesses. The contribution will help these employers with the cost of onboarding and training graduates, an essential step toward self-sufficiency. Tocci’s relationship with Straight Ahead is part of the firm’s ongoing mission to improve the communities in which they live and work. The firm’s team members regularly contribute to a variety of charitable organizations, and the company is an active supporter of initiatives such as Habitat for Humanity, Boy with a Ball, The New You, the SPARK Center at Boston Medical Center and the All Stars Project Inc. This mission of Straight Ahead Ministries is to transform the lives of juvenile offenders, leading to reduced recidivism, greater self-sufficiency and more responsible thinking. This is achieved through the blending of an intensive engagement model, a professional case management model, and character development. Programs are offered in juvenile detention facilities and in the community, and focus exclusively on youth, age 14-24, who want to choose a new direction for life. Straight Ahead’s recidivism rate is 24% compared to the national average of 68%. For more information, visit www.straightahead.org.